43S6500 Smart Android TV - 43"
Shopping online has gotten easier over the years with Jumia. Our platform makes shopping fun with amazing deals, jaw-dropping reduction in the prices of the items as well as special discount offers which occurs from time to time. Irrespective of your class, we provide you with products that align with your budget. Our online store is updated from time to time so you can stay up to date with the latest fashion trend. Explore your favourite fashion designers like Adidas, Puma, Ralph Lauren, Nike and more in our catalogue of top fashion collections. Step out looking classy and elegant with Jumia Fashion and style which ranges from women’s shoes, fashion accessories, underwear, Jackets, office wears, jeans, sunglasses, shorts, sneakers as well as men's shoes, office wears, fashion accessories and so on. You can also look through our African and traditional section, we have beautiful attires that you could choose from for your next event. Are you thinking of a makeover for your home and you don't have time to visit the mall to buy your home furniture and appliances from your favourite brands? Look no further - Jumia provides you with classy pieces of furniture, kitchen appliances, refrigerators, smart TVs, air conditioners, washing machines to suit your personal style, we provide you with the latest trend of items to choose from to give your home that perfect glam. Sometimes, making the best choices for your food and groceries can be extremely problematic, especially when you are on a budget, not to worry, Jumia has got you covered. We offer you a wide range of beverages, cereals, drinks, fresh and packed foods that equal to your expenditure plan. The World's most anticipated football tournament is here again. If you are looking for a high budget smartphone, you can choose from our collection of top brands like iPhone, Samsung, HTC, if you would also like to get an affordable smartphone, we have brands like Xiaomi smartphones, Tecno smartphones, Infinix smartphones and so on to fit into your spending plan. Explore our wide range of best selling smartphones including iPhone 8, iPhone X, Samsung S9, Samsung Note 9 and a lot more. If you want an amazing shopping experience then Jumia is the right place to be. We provide you with a flexible payment option, you can choose the cash on delivery payment mode, Tigo cash or MTN mobile money for extra convenience. We are committed to giving you a 100% customer satisfaction, this is why you are assured of getting a smooth, effortless and easy shopping experience. 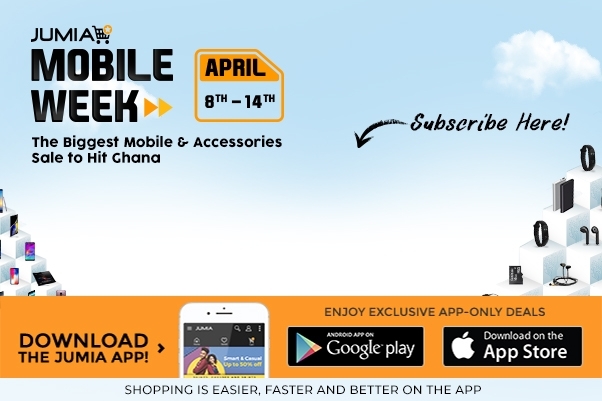 Also, download the Jumia mobile app for easy and fast access to the latest deals, flash sales, discount sales, clearance sales and much more. All you need to do is shop for your favourite items on our site and it would be delivered to your preferred location. Start shopping today!